madeleine brown handmade: Home and away. Phew! What a huge month it has been- full of family, old friends and travel. I've been to a wedding and a funeral, a first birthday party for the world's cutest child (my niece, of course) and caught up with a childhood friend I hadn't seen in years. None of these things in Brisbane, mind you. I'm racking up some frequent flyer points, oh yes I am. I have one more wedding on the agenda, and then I'm more or less a homebody for a while. I love my home. I love my husband and my bed and my books and all my stuff. I love getting away, but home is always such a relief, isn't it? Wedding number one was on Stradbroke Island, for my dear friends Matt and Viv. They threw a cracker, with weather to match. 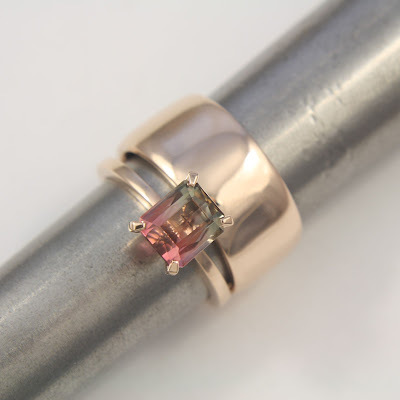 Vivienne sourced a watermelon tourmaline and its stunning colours really required just the simplest of delicate little settings to show it off. It's made in rose gold, which matches Matt's wide, clean rose gold band. I'm so happy I could contribute to their special day, and being there to see the rings go on the fingers is just the icing on the cake for me. Mmmm. Cake. holy banana bread, that stone is AMAZING - and rose gold- so beautiful. Such a fitting name for the gem - no one around here has ever seen that before! Inspired design! Brinkhaus Jewellers is located in Claremont (Perth) in Western Australia. For Thirty years, Brinkhaus Jewellers has been proud to provide exquisite jewellery, individually designed and hand-crafted by our onsite master goldsmiths. Situated in the boutique, our open-concept workshop offers our clientele a rare glimpse of our goldsmiths at work. Here are available Designer Jewellery Perth Brinkhaus Jewellers, handmade Designer Jewellery, online luxury jewellery, diamonds engagement rings perth, Wedding Rings custom, jewellery designersin Perth, jewellery designers, custom diamond jewellery and diamond ring designs.